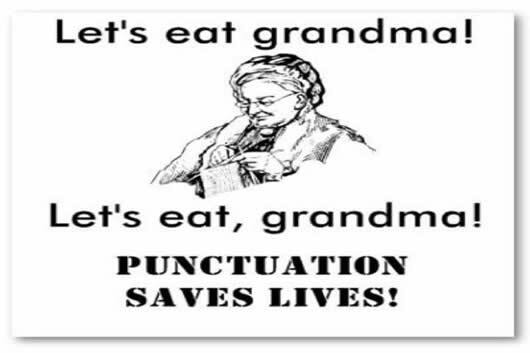 Punctuation is the practice of making small marks into writing, which help the reading and interpretation of the text. It also helps divide the text into sentences, phrases or clauses. The most common types of sentences are period (full stop), comma, question mark, exclamation mark, apostrophe, colon, semi-colon, hyphen, etc. Nearly everything uses punctuation. You will never see a text that is completely devoid of punctuation. Even if nothing else is used, there will at least be periods (full stop) and commas in the text. Just take this paragraph into example. It incorporates the period, comma, and brackets. Punctuation is commonly used only in writing. They are not used in speaking, because they are marks, which can only be seen. However, we do punctuate our sentences with tone and body language. Think for example saying, “My name is John.” While speaking, note how at the end of the sentence we break of suddenly. This denotes to the hearer that that is the end of the sentence. Now imagine saying, “Is your name Mary?” See how at the end the sentence end with the raising of the tone before cutting of, that denotes a question. Fruits: apple, oranges, and bananas. She said she has to go; I don’t know why.